Greg Weeks is an Associate Professor in the ANU College of Law. He holds undergraduate degrees in Arts (History) from the University of Sydney and Law from UNSW, and a PhD from UNSW. Prior to embarking on an academic career, Greg practiced as a solicitor in the litigation group of a large national firm. He has taught law at UTS, the University of Sydney and most recently for six years in the UNSW Faculty of Law. He is widely recognised as an expert in administrative law and is an author of many publications in that and related areas, including a monograph entitled Soft Law and Public Authorities: Remedies and Reform (Hart Publishing, 2016) and, with Mark Aronson and Matthew Groves, the leading Australian administrative law text, Judicial Review of Administrative Action and Government Liability (Thomson Reuters, 6th ed, 2017). Mark Aronson, Matthew Groves and Greg Weeks, Judicial Review of Administrative Action and Government Liability, (6th ed, Thomson Reuters, 2017). Matthew Groves and Greg Weeks (eds), Legitimate Expectations in the Common Law World, (Hart Publishing, Oxford, 2017). Greg Weeks, Soft Law and Public Authorities: Remedies and Reform, (Hart Publishing, Oxford, 2016). “Soft Law and Public Liability: Beyond the Separation of Powers?” (2018) 39 Adelaide Law Review 303. “Monetary Awards for Public Law Wrongs: Australia's Resistant Legal Landscape” (2018) 41 University of New South Wales Law Journal 1160 – 1187 (with Ellen Rock). "ADJR at 40: In its Prime or a Disappointment to its Parents?” (2018) 92 AIAL Forum 103 – 110. "Planning and Soft Law” (2018) 24 AJ Admin L 252 – 270 (with Linda Pearson). "Advance Tax Rulings in Perspective: A Theoretical and Comparative Analysis" (2014) 21 New Zealand Journal of Taxation Law and Policy 362 - 389 (with Benjamin Alarie, Kalmen Datt and Adrian Sawyer). “The Public Law of Restitution" (2014) 38 Melbourne University Law Review 198 - 239. “The Use and Enforcement of Soft Law by Australian Public Authorities” (2014) 42(1) Federal Law Review 181 - 216. '“Officers of the Commonwealth” in the Private Sector: Can the High Court Review Outsourced Exercises of Power?' (2013) 36 University of New South Wales Law Journal 316 - 357 (with Janina Boughey). “A Search for Rights: The History of Judicial Responses to Migration and Refugee Cases” in J Boughey, M Groves and D Meagher (eds), The Legal Protection of Human Rights in Australia (Hart Publishing, 2019) (forthcoming, with Emma Dunlop and Jane McAdam). “Attacks on Integrity Offices: a Separation of Powers Riddle” in G Weeks and M Groves (eds), Administrative Redress Inside and Outside the Courts (Federation Press, 2018) (forthcoming). “Government Accountability as a ‘Constitutional Value’” in Rosalind Dixon (ed), Australian Constitutional Values (CUP, 2017), 99 – 120 (with Janina Boughey). "What Can We Legitimately Expect from the State?" in Matthew Groves and Greg Weeks (eds), Legitimate Expectations in the Common Law World (Hart Publishing, 2016), 147 – 164. "The Legitimate Expectation as an Instrument and Illustration of Common Law Change" in Matthew Groves and Greg Weeks (eds), Legitimate Expectations in the Common Law World(Hart Publishing, 2016), 1 – 16 (with Matthew Groves). "The Essence of a Fiduciary Relationship: Justice Mason’s dissent in Hospital Products Limited v United States Surgical Corporation" in Andrew Lynch (ed), Great Australian Dissents(Cambridge University Press, 2016), 209 – 228 (with Simone Degeling). “Doping in Sport: What Role for Administrative Law?” in Ulrich Haas and Deborah Healey (eds), Doping in Sport and the Law (2016), 147 – 168 (with Narelle Bedford). “The Legitimacy of Expectations About Fairness: Can Process and Substance be Untangled?” in John Bell et al (eds), Public Law Adjudication in Common Law Systems: Process and Substance (Hart Publishing, 2016), 165 - 187 (with Matthew Groves). “Substantive (Procedural) Review in Australia” in Mark Elliott and Hanna Wilberg (eds), The Scope and Intensity of Substantive Review: Traversing Michael Taggart’s Rainbow (Hart Publishing, 2015) 133 - 162, (with Matthew Groves). “Holding Government to its Word: Expectation, Estoppels and Substantive Unfairness in Administrative Law” in Matthew Groves (ed), Modern Administrative Law in Australia: Concepts and Context (Cambridge University Press, 2014), 224 – 247. The ANU Law-based Federal Law Review has awarded the annual Zines Prize for Excellence in Legal Research to Monash University-based Faculty of Law contributor Dr Lisa Burton Crawford. The ANU Law School has a long tradition of excellence in administrative law scholarship and of engagement with government and the private profession in public law. MinterEllison's Administrative Law team and the ANU Centre for International and Public Law (CIPL) are holding a Pub Law Forum. Greg Weeks is a leading administrative law scholar. His primary research interests are judicial review of administrative action and obtaining remedies against public authorities. His published work has been cited by Australian courts and in the published works of leading Australian and international scholars. He is the General Editor of the Australian Journal of Administrative Law and an editor of the Federal Law Review. Greg's books include Soft Law and Public Authorities: Remedies and Reform (Hart Publishing, Oxford, 2015), the edited collections Administrative Redress In and Out of the Courts: Essays in Honour of Robyn Creyke and John McMillan (Federation Press, 2019) and Legitimate Expectations in the Common Law World, (Hart Publishing, Oxford, 2017) with Matthew Groves and, with Mark Aronson and Matthew Groves, Judicial Review of Administrative Action and Government Liability, (6th ed, Thomson Reuters, 2017). Greg's main research interests are in judicial review and issues in public law generally, state liability, and public and private law remedies against public authorities. 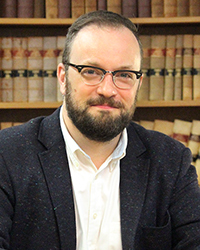 He is currently working on three projects related to soft law, including one to be presented at the Supreme Court of NSW Conference, and (with Matthew Groves) will present a paper on the 'indigenisation' of Australian administrative law at a conference in Singapore. Greg Weeks and Matthew Groves (eds), Administrative Redress In and Out of the Courts: Essays in Honour of Robyn Creyke and John McMillan (Federation Press, 2019). Greg Weeks, Soft Law and Public Authorities: Remedies and Reform, (Hart Publishing, Oxford, 2015). “Attacks on Integrity Offices: a Separation of Powers Riddle” in G Weeks and M Groves (eds), Administrative Redress In and Out of the Courts: Essays in Honour of Robyn Creyke and John McMillan (Federation Press, 2019) 25 – 43. "The Iceberg of Australian Administrative Law: Justice Before and Beyond Judicial Review" in Greg Weeks and Matthew Groves (eds), Administrative Redress In and Out of the Courts: Essays in Honour of Robyn Creyke and John McMillan (Federation Press, 2019) 1 - 11 (with Matthew Groves). “Government Accountability as a ‘Constitutional Value’” in Rosalind Dixon (ed), Australian Constitutional Values (CUP, 2017), 99 - 120 (with Janina Boughey). "What Can We Legitimately Expect from the State?" in Matthew Groves and Greg Weeks (eds), Legitimate Expectations in the Common Law World (Hart Publishing, 2017), 147 – 164. "The Legitimate Expectation as an Instrument and Illustration of Common Law Change" in Matthew Groves and Greg Weeks (eds), Legitimate Expectations in the Common Law World(Hart Publishing, 2017), 1 – 16 (with Matthew Groves). “ADJR at 40: In its Prime or a Disappointment to its Parents?” (2018) 92 AIAL Forum 103 – 110. “Planning and Soft Law” (2017) 24 AJ Admin L (forthcoming, with Linda Pearson). "Estoppel and Public Authorities: Examining the Case for an Equitable Remedy" (2010) 4 Journal of Equity 247 - 287. "A Marriage of Strangers: the Wednesbury standard in tort law" (2010) 7 Macquarie Journal of Business Law 131 - 146..
"The Expanding Role of Process in Judicial Review" (2008) 15 AJ Admin L 100 - 116. "Litigating Questions of Quality" (2007) 14 AJ Admin L 76 - 85. "Superannuation Complaints Tribunal and the Public / Private Distinction in Australian Administrative Law" (2006) 13 AJ Admin L 147 - 163. “The Statutory Shield of the Executive: To What Extent Should Administrative Action Evade Judicial Scrutiny?”, presented at the Interpreting Executive Power Workshop, UNSW Law, Sydney, 14 December 2018 (with Dominique Dalla-Pozza). “Attacks on Integrity Offices: a Separation of Powers Riddle”, presented at the Public Law Weekend, Australian National University, Canberra, 2 November 2018. “The Australian Constitution Rises as Ultra Vires Declines”, presented at the Indigenising Administrative Law Symposium, National University of Singapore, 7 – 8 December 2017 (with Matthew Groves). “Soft Law and the Liability of Public Authorities”, presented at the New South Wales Supreme Court Annual Conference, Blue Mountains, 25 – 26 August 2017. “ADJR at 40: in its prime or a disappointment to its parents?”, presented at the Minter Ellison / CIPL Seminar on the 40th Anniversary of the ADJR Act, Canberra, 27 April 2017. “Soft Law: Effective Regulation, Perilous for the Regulated”, presented at Administrative Law in 2016: Shifting Sands or Stagnant Swamp? – AGS Administrative Law Forum, Canberra, 11 November 2016. “Governing Without Parliament: the Impact of Soft Law”, presented at New Theories of the State’s Authority: Beyond the Separation of Powers, National University of Singapore, 31 October - 2 November 2016. “Self-regulation and Soft Law”, presented at the Regulation, Litigation and Enforcement: Adjuncts & Alternatives to Traditional Enforcement Seminar, UNSW Law, 23 September 2016. “Government Accountability as a ‘Constitutional Value’”, presented at the Australian Constitutional Values Workshop, UNSW Law, 10 June 2016 (with Janina Boughey). “Soft Law in the Jurisdiction of the Land and Environment Court”, presented at a Twilight Seminar for the Land and Environment Court of New South Wales, 13 April 2016. "Justice Mason and the Essence of a Fiduciary Relationship: Hospital Products Limited v United States Surgical Corporation", presented at the Great Australian Dissents Workshop, UNSW Sydney, 9 June 2015 (with Simone Degeling). "The Legitimacy of Expectations About Fairness: Can Process and Substance be Untangled? ", presented at the Public Law Conference: Process and Substance in Public Law, University of Cambridge, Faculty of Law, 15 - 17 September 2014 (with Matthew Groves). "The Use of Soft Law by Australian Public Authorities: Issues and Remedies", presented at the Practice and Theory of Soft Law Academic Symposium, Peking University Soft Law Centre, 9 July 2011. "A Marriage of Strangers: the Wednesbury standard in tort law", presented at the Gilbert + Tobin Centre of Public Law Postgraduate Research Conference, UNSW, 12 July 2010. Department of Attorney-General and Justice (NSW), Reform of Judicial Review in NSW (11 April 2011). Administrative Review Council, Judicial Review in Australia: Consultation Paper (1 July 2011). Joint Select Committee on Australia's Immigration Detention Network (with Jane McAdam, Fiona Chong and Alice Noda, 11 August 2011). "The High Court on Repudiation of Contract" (2008) 119 Australian Construction Law Newsletter 48 - 49. "Case note: Civic Capital Ltd v Australian Securities and Investments Commission" (2008) 15 AJ Admin L 126 - 127. "Leading Cases in Australian Law: A Guide to the 200 Most Frequently Cited Judgments by Daniel Reynolds and Lyndon Goddard" (2016) 24 AJ Admin L 65. “Statutory Interpretation in Australia (8th ed) by DC Pearce and RS Geddes” (2015) 22 AJ Admin L 132 – 133. “Justice in Tribunals (4th ed) by JRS Forbes” (2015) 22 AJ Admin L 201 – 202. “Administrative Justice and its Availability by Justice Debra Mortimer (ed)” (2015) 23 AJ Admin L 56 – 57. “Judicial Remedies in Public Law (5th ed) by The Hon Mr Justice Clive Lewis QC” (2015) 23 AJ Admin L 59 – 60. "Murray Gleeson: The Smiler by Michael Pelly' (2014) 21 AJ Admin L 230 - 232. “Judicial Review: The Laws of Australia by Mark Robinson (ed)” (2014) 22 AJ Admin L 63. “Australian Public Law (2nd ed) by Gabrielle Appleby, Alexander Reilly and Laura Grenfell” (2014) 22 AJ Admin L 65 – 66. “Public Law: Text, Cases, and Materials (2nd ed) by Andrew Le Sueur, Maurice Sunkin and Jo Eric Khushal Murkens” (2014) 22 AJ Admin L 64 – 65. "Towards a Public Law of Tort by Tom Cornford" (2009) 17 Torts Law Journal 311 - 318. “Review of Academic Results: Can and Should Students Take Legal Action?” (2019) 26(1) AJ Admin L (forthcoming). “Fairness, Chance and Discretion in Judicial Review” (2018) 25(3) AJ Admin L 147. “Natural Justice Beyond Individual Affectation” (2018) 25(2) AJ Admin L 81. “Legislative Limitations on Judicial Review: the High Court in Graham” (2018) 24(4) AJ Admin L 209. “The Enduring Mystery of Minister for Immigration and Citizenship v Li” (2017) 24(3) AJ Admin L 145. “Farewell to Damien Cremean; Submissions; Current Issues” (2017) 24(1) AJ Admin L 3. “Protection of Refugees Who Do Not ‘Live Discreetly’” (2015) 346 Australian Administrative Law Bulletin 5. “The Closure of the Office of the Australian Information Commissioner” (2014) 342 Australian Administrative Law Bulletin 5. I am currently supervising: Narelle Bedford: "Merits review in Australian tribunals – at the frontiers of a hybrid jurisdiction" (ANU). Completed supervision: Jason Donnelly: "Re-shaping the separation of powers in Australia – the non-justiciable nature of national interest" (UNSW). I am willing to supervise in the areas of my research interests. My teaching philosophy is simple to articulate but rather more complex to realise. I aim to make my students excellent legal practitioners with a deep understanding of, if not passion for, the law. Administrative law (and other subjects, like torts) do not generally arouse excitement in new students but my (unfeigned) enthusiasm for them and capacity (through expertise) to explain their intricacies in an accessible way has resulted in the vast majority of students giving extremely positive assessments of my teaching.